understood. The Shock discs are a “life limited” part that continually compresses over time, depending on the weight of the Mooney model. The models M20 A thru M20J are less than 2000 pounds and the Lord shocks will last 12 years usually. Mooney models M20K and on are heavier and may compress below limits in 6 months. The Service Manual has extended the compressed limit to allow longer use. Disc compression is measured by the space ,or no space, under the collar at the top of the shock link on both the mains and nose gear. You may notice that the long bodies are “dragging” their tail -so to speak- but that’s usually due to the more extreme compression of the main gear shock biscuits, due to their weight. The “perky tail up” look also improves takeoff and taxi controllability. The early lighter Models may have discs that just harden, in time, and may have surface cracks appear eventually. In this case it would be prudent to check the age of the Lord discs by looking at the date of manufacture molded on the disc. The Gear Extension Safety switch may not function correctly. breaker and failure to lower the gear on landing, OUCH! fairings and cause damage when retracted. Aged discs that become hardened may not appear to be bad, but they are no longer doing their job in absorbing “Shock” on landing or taxiing. This could be abusing the airframe structure and cause premature fuel tank leakage. COSTLY! The Mooney nose gear takes more abuse than any other area on the airplane. Maybe that’s why LASAR has become an expert in this area. LASAR has more STCs and PMA parts approved for maintaining and improving the Mooney nose gear, than any other areas, including Speed Mods. The Nose Gear has a lot of “moving parts” as it has to pivot and steer, flex to absorb shock, as well as, retract, close the gear doors, and hold more than 600 pounds static weight on a single pivot bolt, and allow towing. It’s a clever design by Al Mooney, but its design is hard to perfect, as it is still subject to damage from “over steering” and denting the “truss tubes”, and wear due to steel to steel contact in the pivot/steering motion. LASAR rebuilt leg trusses gets wear areas built up and re-machined, before heat-treating, to restore the part to new tolerances, and offers an oversize aluminum/ bronze bushing and NAS bolt to provide a longer life. 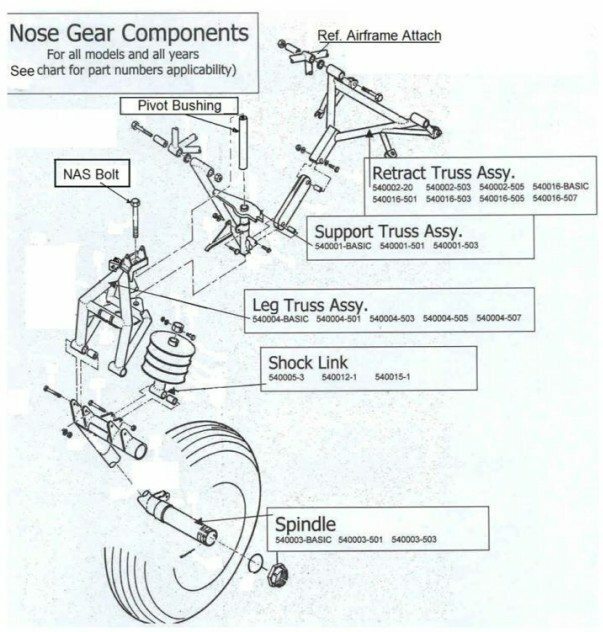 Frequent maintenance and care of the nose gear can extend the life of its components, but are often ignored or wear symptoms go unrecognized. Mooney Service Manual says to remove the cotter pin on the pivot bolt nut and recheck the torque every 100 hours. LASAR has rebuilt over 8000 Nose gear leg trusses in the past 45 years and unknown quantities of the steering horns sent to us for exchange replacements. The steering horns that get rebuilt come to LASAR due to wear and slop between the rudder pedals and the nose wheel. The older horns get re-bushed with a new aluminum /bronze tough bushing. In that bushing a new “T” shaft is installed. The “T” shaft is skillfully machined, welded, heat-treated with a lubricating coating and properly shimmed on assembly. Then the whole unit is epoxy painted and a new pivot bearing replaced with new hardware. The later and current production steering horns receives the same treatment except the bore is reamed to accept the aluminum/ bronze “tough bushing”. This eliminates some of the wear, due to the soft steel to steel rotation, of the original horn. Along with the rebuild processes, LASAR re-designed the entire steering horn assembly and produces them under the PMA and is STC approved to replace all Steering horns on all models. The pivot stud, that is welded onto the airframe permanently, is subject to wear also so LASAR developed a replacement “stud” that clamps on securely after cutting off the original stud. All these new and rebuild processes address the wear problem and eliminate the need for such frequent service and replacement.